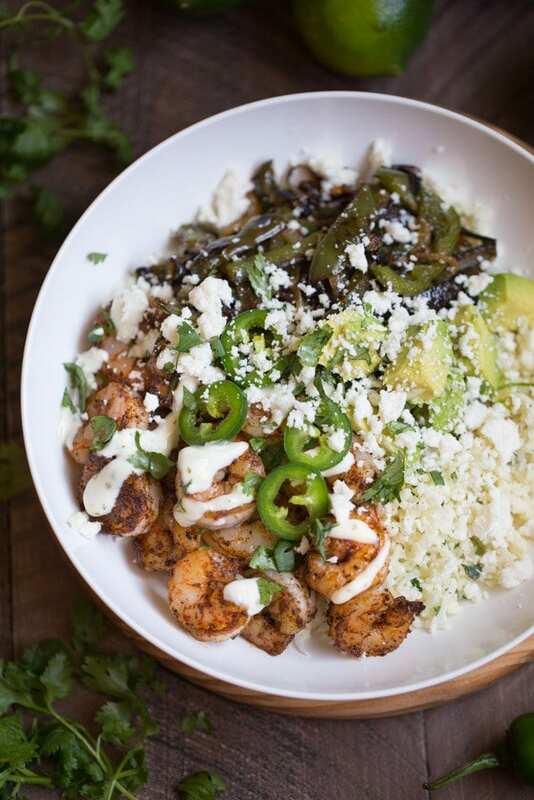 Shrimp Fajita Bowls are a low carb meal option that are packed with flavor. Fajita seasoned shrimp and sautéed onions and peppers lay over a bed of cilantro lime cauliflower rice. Sliced jalapeños, diced avocado, queso fresco, and chopped cilantro garnish this meal. A drizzle of ranch dressing tops it off. Hellooo and Happy Monday! 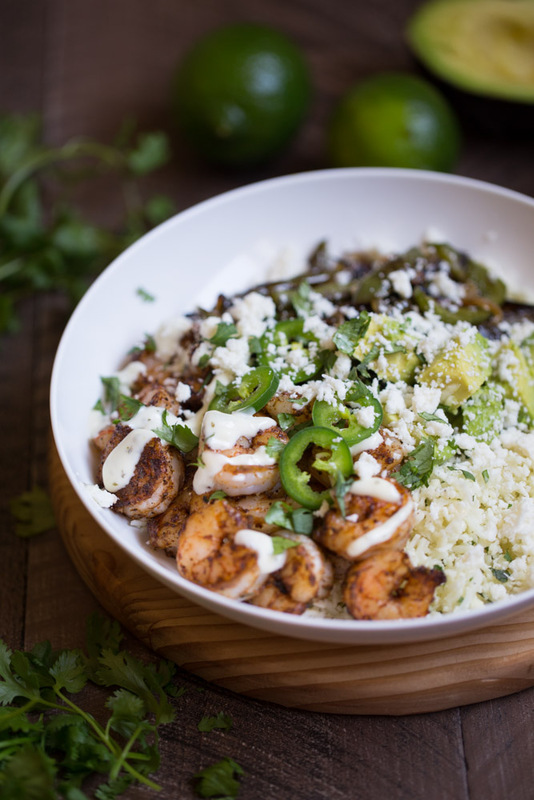 I’m so excited to be sharing these Shrimp Fajita Bowls with you today because they are so darn good! We had them for lunch yesterday and as I was eating my bowl, I kept thinking to myself, darn, this is really REALLY GOOD! I want you to try them so you can find out how good they are. ? I’ve made a lot of taco type bowls and typically, the base is some sort of grain – usually rice or quinoa. 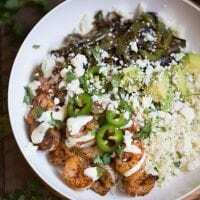 Ken and I are trying to eat fewer grains and keep the carb counts low so I decided to give cauliflower rice a try in these shrimp fajita bowls. I never had cauliflower rice before nor had I ever made it but having a food processor made making it super easy. I used this simple tutorial from Cook Eat Paleo to learn how to make the cauliflower rice. Since this meal has a Tex-Mex flair, I wanted the cauliflower rice to be something more than plain ol’ rice. I tossed some fresh lime juice and cilantro with it. Mmmmmmmmmm. Incredibly good idea. 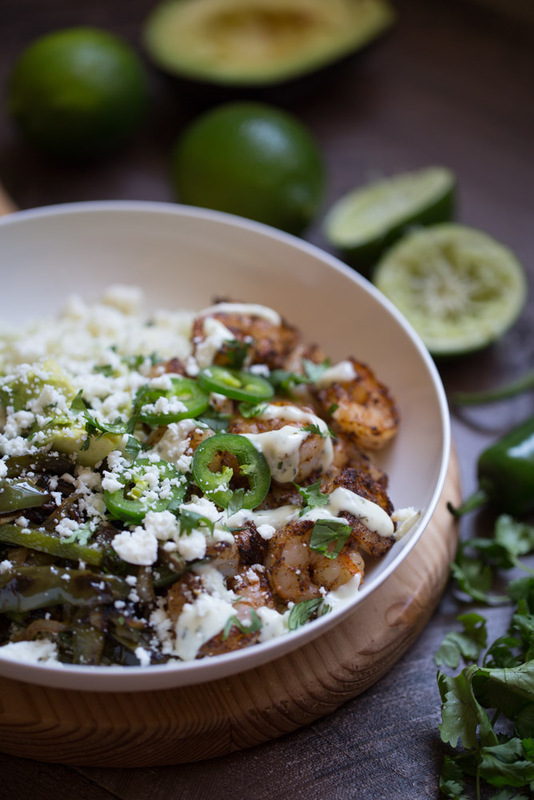 Shrimp fajita bowls wouldn’t be shrimp fajita bowls if they didn’t include typical fajita ingredients like sautéed peppers and onions, jalapeños, avocado and of course, cheese. I included all of those ingredients in these healthy little bowls of goodness and when it came to the cheese, I opted for queso fresco because I LOVE IT. Feel free to use your favorite type of cheese. Sharp cheddar would be great. If you’re looking for a good sharp cheddar, Cabot’s Farmhouse Reserve and White Oak Cheddar are phenomenal. They’re high in protein (32 grams per serving). They’re filling but don’t make you feel ridiculously full and bloated. Can we say TEX-MEX FARE?! Place cauliflower rice in a mixing bowl. Add lime juice and cilantro. Mix well. Set aside. Heat 1 tbsp olive oil in a large skillet over medium high heat. Season peppers and onions with salt and pepper and add to the skillet. Cook until tender, about 7-10 minutes. Remove from the pan and set aside. While peppers and onions are cooking, heat ½ tbsp coconut oil in another skillet over medium high heat. Season the shrimp with fajita seasoning. Place in the skillet and cook 1-2 minutes per side. Cook in batches if needed, adding more coconut oil to skillet if needed. Remove from skillet, set aside. If needed, heat the cauliflower rice in a microwave. Divide the cauliflower rice between 2 bowls. Top with the shrimp, peppers and onions, avocado, queso fresco, jalapeño slices and drizzle with the ranch dressing. Sprinkle with chopped cilantro. Nutrition content was calculated using My Fitness Pal. All values are approximate. Changing or altering quantity of toppings will change the nutritional values. This looks SO comforting! And a perfect quick dinner! I seriously must make this! The perfect mixture of healthy and comfort food!! It sure is. Thank you so much, Amanda! Everything I want in a bowl! Yummy! Oh yum!!! What a Delicious and pretty dish!! I love everything about this from the shrimp to the cauliflower rice! I’m totally digging this shrimp bowl! I love that you used cauliflower rice too! Love everything about these fajita bowls! This would be a hit at our house! I have not tried cauliflower rice before. Looks interesting. The Wegman’s in my area sells it. We made this tonight, and it was great! It’s the first time for cauliflower rice for me, but it won’t be the last. Such a beautiful and tasty meal! !